Cookie baking season has officially begun! Usually I have multiple batches of holiday cookies in the freezer by this point in the season but I’m running a bit behind. The past month or so has been pretty busy, which is why I haven’t posted in a while. My baby sister got married last month. It was a beautiful day. Then my husband and I spent eight glorious days in Turks and Caicos. We stayed Seven Stars Resort, which is the same place we went to four years ago. Obviously we loved it enough to return and for good reasons. The hotel is great, the food is delicious, the people are nice, and the beach is stunning. It’s hard to go wrong with relaxing, eating, and enjoying the beach views. We absolutely recommend it. When we returned from vacation we were thrown right into the hectic (but nice) Thanksgiving holiday. Then I got sick. Thankfully I’m finally feeling better but it was a doozy. As you can see, life happened. I’m excited to be back and sharing a cookie recipe with you, which is my favorite thing to share. I wanted to make a cookie that had a chocolate kiss on top, like my peanut butter blossoms that I shared a few years ago. I also knew I wanted a chocolate cookie base. 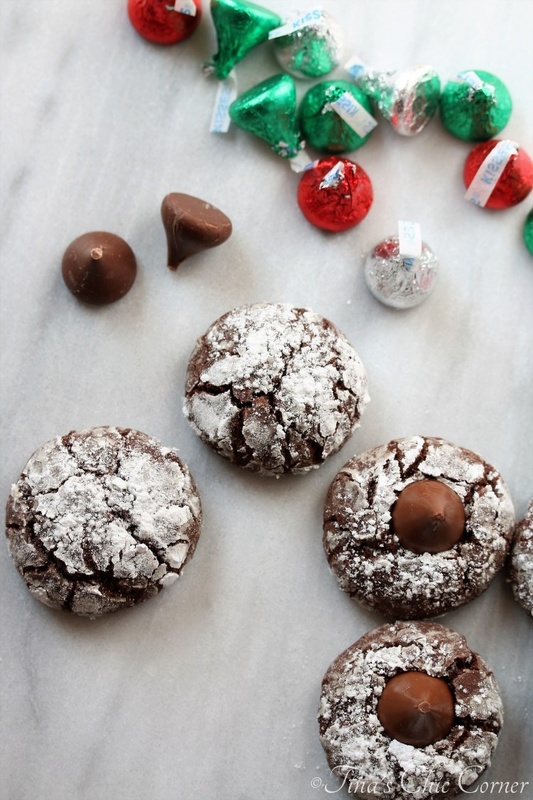 I’m pretty sure that you can take your favorite chocolate cookie recipe and place a kiss on top. Since it’s the holiday season, I thought the chocolate crinkle cookie would be a great cookie base. I made them a few years ago and they were a huge hit. 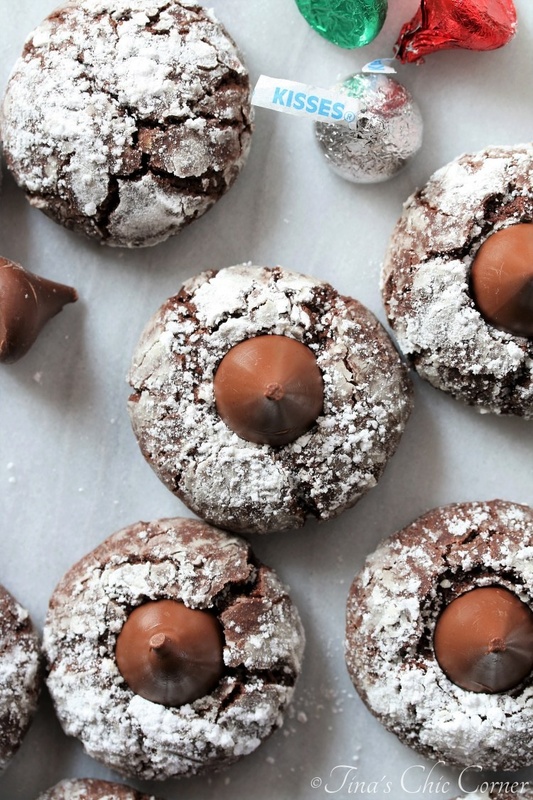 They are like soft pillows of chocolatey goodness coated in powdered sugar. I package up a bunch of homemade cookies for my family and friends every year and these will be the perfect start for the collection. Preheat the oven to 350 degrees F. Lay a silicone mat or parchment paper on top of a baking sheet and set it aside. In a large bowl, cream the butter and brown sugar. 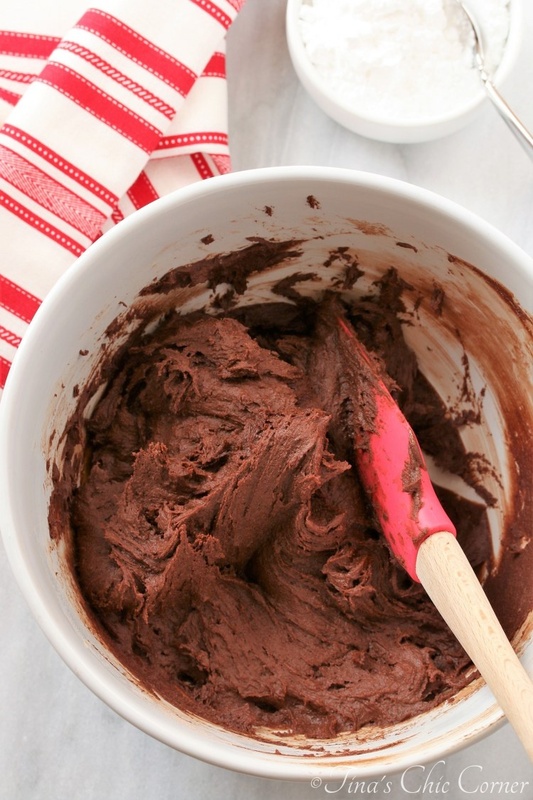 Add in the flour, cocoa powder, baking powder, and salt and mix until everything is combined. Note that the cookie dough will be soft and sticky. Put the powdered sugar in a separate small bowl. Scoop about 1 and 1/2 tablespoons of cookie dough directly it into the powdered sugar bowl and roll it around into a ball until it’s well coated. I used the OXO good grips medium cookie scoop. Don’t try to roll the dough before you coat it with the powdered sugar because it’s way too sticky and will get all over your hands. 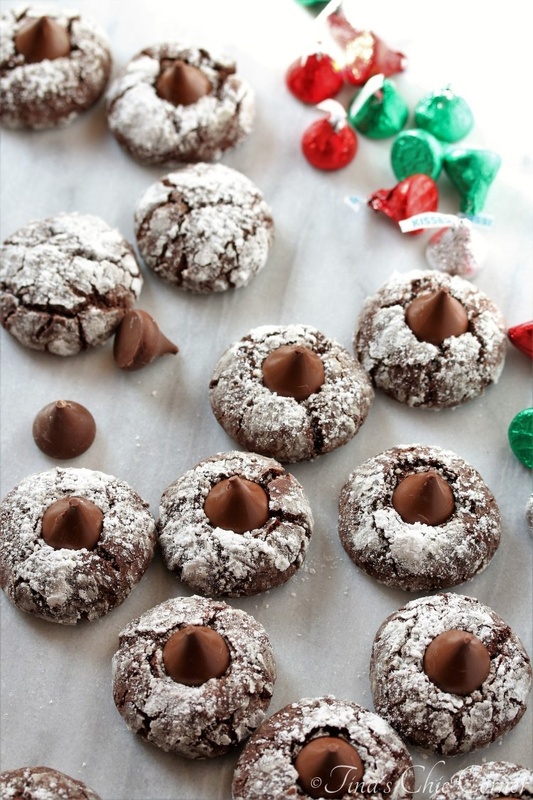 As soon as they come out of the oven, gently place 1 chocolate kiss in the middle of each cookie. 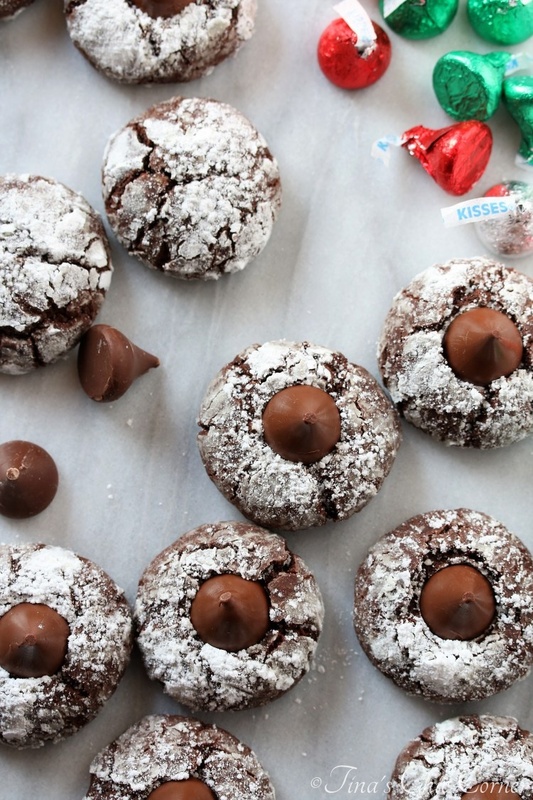 Tina what a good idea to make the chocolate crinkle cookie and adding the kiss. They look so good. Yummy!